Dell's premium business offering, the Latitude 13 7370, is currently available on Dell's eBay store for just US$599 — more than 50% off its original price of US$1,300. The discounted price also includes a US$100 on-page discount. 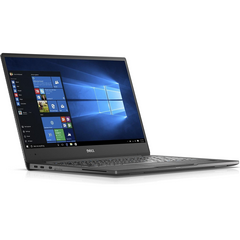 If you are in the hunt for a premium business laptop, the Dell Latitude 13 7370 should definitely be on your radar. The Latitude 13 sports a 13-inch dis core m5-6 play in a 12-inch chassis and is built for business with carbon fiber and aluminium construction. This svelte laptop originally starts at US$1,299 but you can snag one now on eBay for less than half the price — at US$599! The Latitude 13 7370 is powered by the Intel Core m5-6Y57 processor, which is a passively cooled 4.5W TDP CPU (Dell has increased the maximum TDP in this notebook to 5.5W in lieu of short-time TDP exceedances). The ultrabook features a FHD InfinityEdge display borrowed from the Dell XPS 13. While the display produces bright, vivid images, the placement of the webcam in the bottom bezel will leave video callers staring at your nose. The Core m5 processor is coupled to 8 GB of LPDDR3 RAM. Storage is provided by a 128 GB M.2 SATA SSD. Intel 8250 Dual Band WiFi and Bluetooth 4.1 round off the connectivity options. There are 2 Thunderbolt 3 ports with full 40 Gbps bandwidth unlike its XPS and Precision counterparts, which feature only 20 Gbps Thunderbolt 3 ports. Windows 10 Pro comes pre-installed and you get a standard 1 year warranty. Even though the processing power is a tad on the lower side, it still matches up to its actively-cooled contemporaries given that a recent BIOS update enabled the ultrabook to handle short-peak loads at the maximum Turbo Boost speeds. The discounted price is a steal given the performance and mobility offered. Therefore, grab it while it lasts.